We welcome you to our center. Take a tour and see the wonderful place where your child can learn. If you know anyone who needs our services, please don’t hesitate to refer them to us. Your little one is very impressionable at this tender age. This makes choosing the right child care center all the more important for your child’s benefit. Give your kid the best by enrolling him/her in a very conducive place to learn and grow together with other children and our caring staff. American Childcare Centers reaches out to these young learners in a way that they respond to positively. Our center is built for your child to feel at home and comfortable, so learning will be easy for them. American Childcare Centers ensures that your child will be given high-quality child care services every time they are with us. 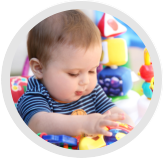 Our mission is to be the best child care center in the state by continuously and unfalteringly providing excellent services to children who are under our care, and by fostering a good relationship with their parents.